The system and corresponding process includes a system for producing a mechanical image of original audio source media and a system for encoding the mechanical image information into a digital file. A processing system recovers the mechanical image information from the digital file at a receiving end. Audio processing is used to produce the original audio source material without the standard losses associated with digital encoding of audio material. This process removes the digital to analog sampling losses that all current digital streaming systems are prone to. It will allow any device to reproduce analog quality audio anywhere. $650 million dollar a year worldwide market..
25% of that considers high quality analog recordings a 'value added' proposition. $100's of millions spent every year on 'vintage' or reproduced vintage audio equipment to recapture the original sonic spectrum from analog recordings. Failed systems that still relied on Analog to Digital conversion as its means of encoding recorded media for distribution and reproduction by consumers. i.e. PONO etc. 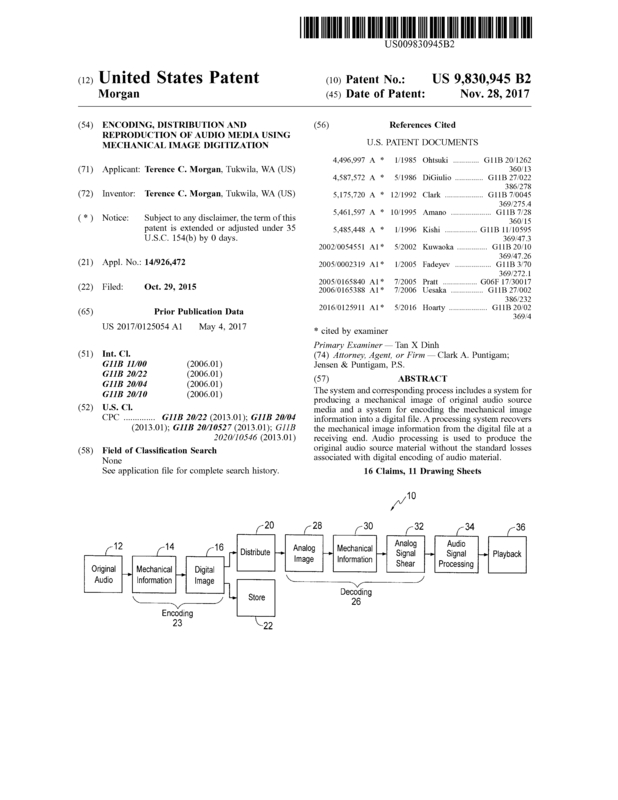 The solution to analog quality streaming /storage and end user reproduction is in this patent. We do not use Analog to Digital conversion to encode the media and hence do not suffer from the losses of those systems that rely on it. Additional patents in reference to this patent are in final stages at the patent office. Our research into imaging and classes of operational transducer modelers and transducers sets to reproduce the original analog media with extremely high fidelity is well under way. Our 'null' device and mechanical modeling is in 'proof of concept' stage. We are looking to sell this patent and associated patents pending, including all copyrighted research and development to date for an outright sale,license the technology with royalties, or a development partnership. Page created at 2019-04-24 18:06:30, Patent Auction Time.